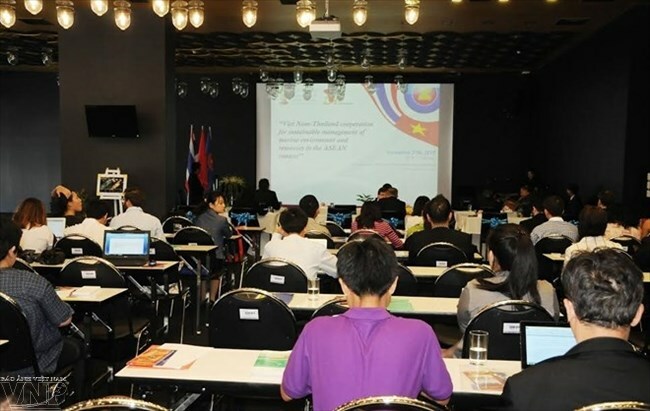 Bangkok (VNA) – Vietnam – Thailand cooperation in managing marine environment and resources was the focus of discussion at a recent scientific workshop held in Chulalongkorn University, Bangkok. The conference was organised by Chulalongkorn University’s ASEAN Research Centre and Centre for Vietnamese Knowledge and Language with the attendance of Vietnamese Ambassador to Thailand Nguyen Tat Thanh, representatives from the Thai parliament and several foreign embassies in Thailand besides scientists, researchers and students from Chulalongkorn University and many other tertiary training establishments. Opening the workshop, Ambassador Nguyen Tat Thanh underlined the growing cooperation between Vietnam and Thailand, of which sustainable management of marine natural resources and environment, navigation safety and freedom, and fishing labour are among important content. He said Vietnam and Thailand, both having long coastlines and sharing a border at sea, as well as being two out of the largest economies in the ASEAN Community, have the shared responsibility of launching new cooperative models for marine resources and environment management in the interest of not only the two countries but also the region as a whole. Papers presented at the workshop dealt with potential and challenges in the management of sea environment and natural resources of the two countries in the context of political, social and economic changes in ASEAN and the role of international law in sea management. They also recommended solutions and measures for the two countries to maximised their interests in bilateral sea cooperation.